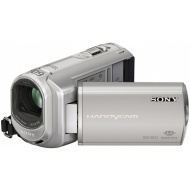 alaTest a collecté et analysé 16 avis de consommateurs et d'experts pour le produit Sony Handycam DCR SX31. La note moyenne du produit est 4.4 sur 5, tandis que les autres Caméscopes ont une note moyenne de 4.0 sur 5. Les testeurs apprécient le zoom. L'ergonomie impressionne, mais les testeurs ont des doutes sur le viseur. Après analyse des notes de consommateurs et d'experts, de l'âge du produit ainsi que d'autres facteurs, et comparé aux autres Caméscopes, le Sony Handycam DCR SX31 obtient un alaScore™ de 79/100 = Bien. Very good internal memory, saving cost of cards etc. A compact straight forward device which is ideal for my needs, family, aviation, pets etc. Good lens cap which even I can`t lose ! I`ve yet to find any. Excellent low weight, good battery life and quick to start up and record, so you don't have to leave it on. easy mode produces good results,semi manual good in unusual circumstances.VERY light weight and easy to carry,ideal if like me you archive too dvd,just plug in phonos to dvd recorder and of you go,reasonable picture on your dvd without the comp rubbish. Easy to use. Light. Quick to open and start filming. Useful touch screen. Image quality good be better. The camera is light wieght and very easy to use. You canswitch easily between video andpicture andthe touch screen is sensitive. It is a remarkable piece of gear. Mivies, Stills and editing are unelievably easy. Had much fun to date. not much actually, just I wish the battrey would last a bit longer. I have not checked but I think the spare battrey might be quite expensive. The camera is very lite and very small. The image quality is very good for a camera with standard image quality. The optical zoom is amazing but is hard to keep the camera steady at high zoom.